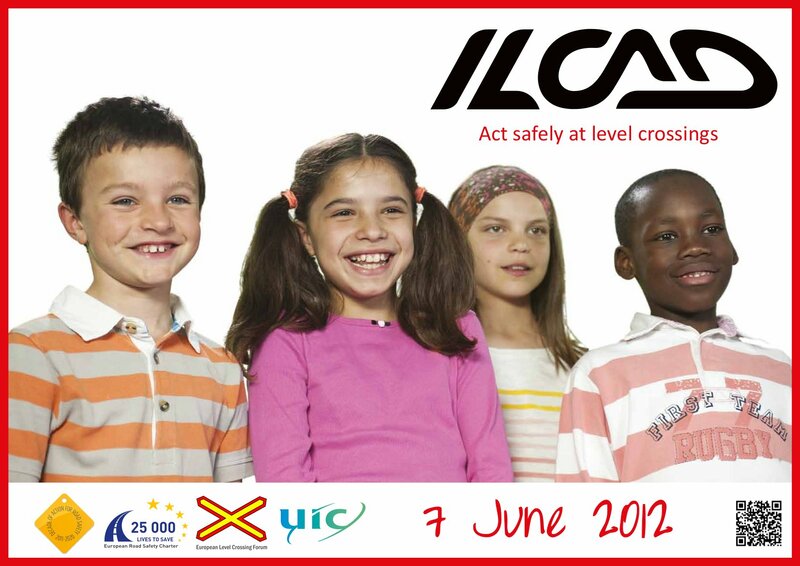 Paris, 7 June 2012): Today the international railway community celebrates the 4th edition of the International Level Crossing Awareness Day (ILCAD) focusing on educational measures and the promotion of safe behaviour at and around level crossings. In more than 42 countries a range of national events will be held jointly at various locations with the common ILCAD message “Act safely at level crossings!”, in addition to regular activities held throughout the year. Trains are undoubtedly one the safest modes of transport. But it is the interface between road and rail, namely level crossings that represent a big operational risk for the railways. The most logical solution would be to engineer out the problem and remove all level crossings but it would restrict mobility in many places. In addition building bridges or underpasses is not always possible in built up areas; it is also very expensive (5 to 10 million EUR in Europe) and is the result of a long process. Level crossings are also very useful to the community and very often local authorities want to keep them. Traversing level crossings is safe for road users and pedestrians as soon as they respect traffic signs and signals as laid down in the Highway Code and based on the UN “Convention on road traffic” and the “Convention on Road Signs and Signals“ both signed in Vienna in 1968 and applied worldwide. According to the European Railway Agency (ERA) 619 accidents caused 359 fatalities in the European Union in 2010 (831 accidents caused 405 fatalities in 2009). They represent 30% of all railway fatalities in the EU against 1.2% road fatalities. Therefore it is considered as a minor problem for the road but a huge problem for the railways. Besides these fatal level crossing accidents, thousands of near-miss incidents occur every day in the world that could lead to a catastrophe if they involve buses or heavy vehicles. Almost 98% of all accidents at level crossings (at least in Europe) are caused by misuse of road users and pedestrians who do not respect traffic signs and signals. These people usually live and work near level crossings. physical reasons such as fatigue (professional drivers), use of drugs and/or alcohol. According to EC figures: 20% of crashes on the roads are caused by fatigue and 25% when driving under the influence of alcohol or drugs. Accidents are also caused by violation. Speeding is the highest risk factor of collision at level crossings as well as in other road areas. According to EC figures 30% of fatal road accidents in the EU are caused by speeding. This is why fixed cameras, speed radars have been installed at level crossings in some countries (U.K., France…). Zigzagging between two closed half barriers by road users; pedestrians jumping over the barriers also represent a high accidents risk. Level crossing accidents have long term and enormous human impact on the society (loss of a beloved person or family, lost contribution to home and work productivity, quality of life, post traumatic effects on the locomotive driver, car or train passengers, on the witnesses, on the injured people, high medical costs..). Society still regards level crossing accidents as a railway problem, despite evidence of motorists being at fault, the impact in the media being very negative. The rail sector alone is not able to control the high risks issued by road users and pedestrians traversing level crossings without the support from other key players including the road and rail sectors, police forces, road users and those with responsibility for licensing those users as well as pedestrians and cyclists. Other initiatives apart from classical engineering solutions could include innovations like alerts or locations of level crossings on satellite navigation systems (U.K. France…), signals sent to cars at level crossings by approaching trains (being tested in Australia). But the core solution still remains human behaviour. That’s the reason why the International Level Crossing Awareness Day is so important to make level crossing users aware of the dangers they face when not respecting the traffic rules and make them aware of the serious risks not only for themselves but also for their accompanying persons, the railway staff members and train passengers. Trains can weigh 1500 tons; the distance for a train to stop can be 10 times higher than for a car. When a train runs at 90 km/h, it takes 800 metres to stop (up to 1200 metres depending on the weight and speed of the train), a car stops within 70 metres. According to RFF: 50% of car collisions between a train and a car lead to a fatality: 5% only when it is a “typical road accident”. Since ILCAD partners have started to tackle the level crossing safety issue through better Engineering, risk mitigation, more Education and more Enforcement, they have been experiencing great decreases in the number of collisions and fatalities, some examples: Operation Lifesaver inc. U.S.A, since 1972: -84% fewer collisions; Operation Lifesaver Canada, since 1980: -75% fewer collisions; RFF, France, since 2000: -50% fewer collisions, REFER, Portugal, since 1999: -84% fewer collisions. On 7 June, an international conference will take place from 16.00 to 17.15 at RFF HQ in Paris. Hubert du Mesnil, President of RFF and Jean-Pierre Loubinoux, Director-General of UIC as well as international rail and road stakeholders, behavioural experts and those involved in prevention will participate in this official kick-off that will be broadcast live around the world. You can watch it at the following link: http://www.securite-passageaniveau.fr/. A press conference will be held prior to this event. The 42 countries involved as well as European and international rail organisations (UIC, CER, EIM), Operation Lifesaver, the European Transport Safety Council (ETSC), the European Level Crossing Forum (ELCF), the European Railway Agency (ERA) and the UN-ECE Transport Division. The Latin American Railway Association (ALAF), the Australasian Railway Association (ARA) and the Association of American Railroads (AAR) are actively involved in this campaign but there is still room for many, many more. The European Commission and UNECE have respectively launched their Road Safety Decade pledging to reduce the number of road accidents, fatalities and injuries in the EU and around the world. ELCF, UIC and ILCAD partners signed the European Road Safety Charter in 2009 through which companies, public authorities, associations and research institutions can commit to supporting the EU to meet its road safety targets by taking concrete steps to improve road safety and share ideas and experiences. ILCAD has also been granted the use of the logo of the UNECE Decade of Action for Road Safety 2011-2020 as part of many other road safety initiatives. UIC organised for the second time the worldwide contest for children on level crossing safety for which we received over 400 drawings. The best drawings from different countries around the world will be exhibited during ILCAD campaigns and other level crossing safety events. Finally a new video has been produced for ILCAD 2012. For more information please visit the dedicated website www.ilcad.org and also visit http://www.securitepassageaniveau.fr/ to view the international ILCAD launch conference in streaming organised at RFF Headquarters, our host in Paris.